EUR 18,14 Buy It Now or Best Offer 22d 8h, EUR 8,85 Shipping, Pay with PayPal and you're fully protected. 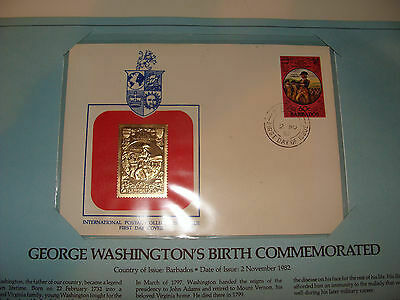 Seller: ennairam (8.368) 99.6%, Location: Hebron, Illinois, Ships to: Worldwide, Item: 132198905710 International Postal Collectors League First Day Cover Barbados George Washington's Birth Commemorated Day of Issue 2 Nov 1982 with 23 kt gold replica stamp in plastic sleeve slipped into (not pasted on) information sheet ********************************************* Be sure to add me to your favorites list! More from ennairam Collectible antique, vintage & new items: instructional music books, classical and popular printed music, antique, vintage & contemporary sheet music, fiction & non-fiction books, texts & instruction manuals, cookbooks, magazines, art prints, travel souvenirs, royal memorabilia, railroadiana, Christmas items (in season), records, cassettes & CDs, opera & theater programs, librettos, VHS tapes, craft manuals, children's books, postcards, collectible stamps, maps, old photos, religious items, pins, charms, ephemera,and much more. Check back often- I am always adding items!Thank you for looking ! Check out my other items! Popularity - 461 views, 0.7 views per day, 698 days on eBay. Super high amount of views. 0 sold, 1 available. 461 views, 0.7 views per day, 698 days on eBay. Super high amount of views. 0 sold, 1 available. Seller - 8.368+ items sold. 0.4% negative feedback. Great seller with very good positive feedback and over 50 ratings. 8.368+ items sold. 0.4% negative feedback. Great seller with very good positive feedback and over 50 ratings.